It really got me thinking about how I used to be one of “those” people. My BMI number was well over 30 and I couldn’t even walk without a lot of pain. I never would have imagined running at all, let alone a half marathon. The experts say that it takes 4 to 6 months to prepare to run a half marathon. It took me a lot longer. 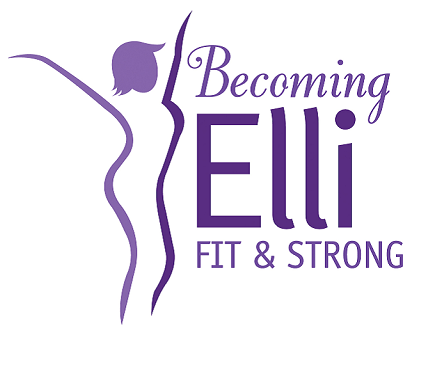 In a few days, our Becoming Elli podcast will reveal what we did to prepare for the half marathon in the months leading up to it. Today, I thought I would write a little bit about how I gradually I worked up to even wanting to do something like this. For me, it started years ago when I turned 50 years old. I realized I needed to do something drastic to regain my fitness and confidence in doing physical things. I knew I couldn’t rush into getting fit without giving up. It took me a long time to get out of shape, so I decided to take my time getting back into shape. Believe me, my mindset didn’t go from “gotta lose weight” to “gotta run a half marathon” without many, many steps in between. Even after losing a lot of weight, it took a long while before I was even thinking of running. 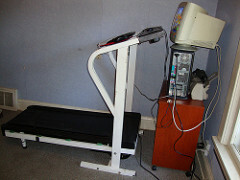 One of the first things I did was set up an old treadmill in the computer room and begin walking while I worked on something. As a marketing consultant, I have a lot of work to complete on the computer. Some people would rather watch videos or read a book. Either way, you don’t get a lot of cardio with a walking desk, but it is a great way to begin. As you can see, this is a home made treadmill desk. 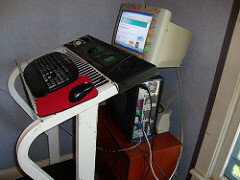 These photos are from early 2009 when my walking desk was put together with an old computer, monitor and keyboard. I really didn’t know where this was going to take me, so I didn’t want to invest a whole lot of money into it. Jill has also found that a walking desk on treadmill works during the times you have a lot of work and still need to move. If you are thinking of getting or creating a treadmill desk, maybe this will inspire you too. 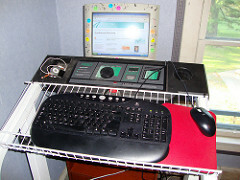 My treadmill desk in 2009. I found I could walk at 2 miles an hour on the treadmill, without losing balance. It is very very slow! I could write blog posts, edit videos, outline marketing plans and put in the hours needed to set up a social media program – and still burn a few calories by staying on my feet. But after three hours of working on the computer, I’d done six miles and found that I could get exercise without getting hurt. Random thought… Does anyone else blame the obesity epidemic on the internet and computers? I don’t think it is just what you eat but how stationery the technology has made us as a society. The next stage of getting fit was walking 5k’s. I did four of them in the fall of 2009 and then my first turkey trot. I hadn’t realized that the turkey trot was actually 4 miles long. I was jogging by that point and was very happy to finish it in just under an hour. Yes, by walking the 5ks and that turkey trot, I was often last in the race. But, I was doing it. I still think that by getting out there and doing it, I am beating everyone who is still sleeping or sitting on their couch. Most of my efforts in 2010 revolved around losing weight, not exercise. And starting to just move, either walks outside – often with the dog – or on the treadmill when the weather didn’t cooperate. Increasing exercise too fast can be a real problem for me. Too much and it really hurts. But bit by bit I gained confidence and by 2011 was doing some spinning classes at the gym. That led to riding my bike. It took quite a while before I was really comfortable on the bike. I never dreamed that I would have run two half marathons in 2018, Cleveland in May and Akron in September. While I am not at all fast, I am determined not to be discouraged! I don’t keep up with most of the other runners, but I am doing it. And to me, that is one of the keys to becoming fit and strong. I look at it as encouragement. It’s a fine line. One important thing I have learned over these years is NOT to compare myself to other people. If they are stronger, faster and more fit, I will either be too motivated (and end up straining or hurting myself) or I will be too discouraged (and want to give up, thinking why bother!) Either way, it’s a nasty outcome. On the other hand, having a plan and working it everyday makes sense to me. Having a rest day. Alternating strength training, running, cycling, yoga keeps me fit without working too much of a good thing. A combination of progressive, but challenging goals, together with recovery methods, is the right exercise recipe for me. How about you? How did you get back in shape? Are you in recovery mode or challenge mode? What is your current challenge? What do you do for recovery? 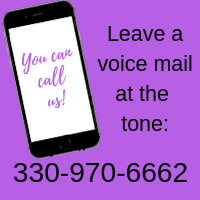 Leave a comment below or send me an email at Chris@becomingElli.com.